Hoping to clean up a stretch of cluttered roadway in the South Bay, one San Jose city councilman wants to acquire $60,000 in city funds to hire homeless people to clean up the piling debris two to three times per week. Bob Redell reports. 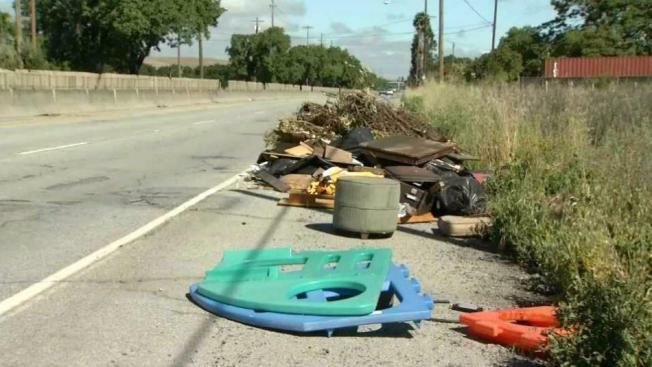 Hoping to clean up a stretch of cluttered roadway in the South Bay, one San Jose city councilman wants to acquire $60,000 in city funds to hire homeless people to clean up the piling debris two to three times per week. The portion of pavement along Monterey Road near Bailey Avenue just north of Morgan Hill has been found to be clogged with piles of used household items, mattresses, furniture and trash, frustrating some nearby residents who drive by the heaps of debris regularly. "It just gets to the point where it's outrageous, where you just go every 100 feet and there's a new pile of trash," Tom Malech of Morgan Hill said. A large city crew complete with a number of vehicles was recently spotted cleaning up piles of rubbish in the area under scrutiny. San Jose city councilman Sergio Jimenez believes more should still be done. "I think the city can always do more," Jimenez said. "And I’m the first to acknowledge that the city doesn’t always get it right. But I think we have hard-working staff here at the city and all the various departments involved in this, including my office, and we want to get it right. To the extent there is more to do, we will do it." Jimenez hopes to collect money soon enough to have homeless people hired and cleaning by late July or early August. The cleanup program would be similar to the Downtown Streets Team program that employs homeless people throughout some Bay Area communities. The city of San Jose is also trying to get permission from Union Pacific to clean debris dumped on the railroad tracks that run parallel to Monterey Road. Malech has lived off of Monterey Road for roughly the last 10 years. He said the debris piling up over the past month or so is the worst he's ever seen it. He wants the city to consider more permanent solutions to the mounting issue such as increased police patrols, surveillance cameras and/or street lights for the problem area, which is dark and quiet at night. "It's really sad to see," Malech said. "I grew up here in Morgan hill. It’s always been a nice little community and very clean. Never in my whole lifetime have I seen dumping like this. This is crazy, and it’s just getting worse every month. Every year it’s just getting worse."